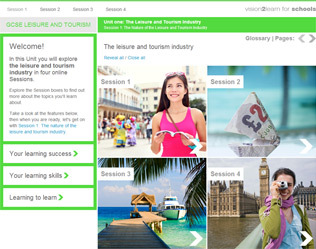 This online resource opens up the wide world of leisure and tourism, helping your pupils develop a clear understanding of the contribution that leisure and tourism makes to society and the economy. Pupils will gain vital problem solving, evaluation and evidence-gathering skills to help them complete their GCSE assessments. This qualification may be used as a platform to access further study in the subject and a career in the leisure, travel and tourism sector. This unit is about understanding the nature of the leisure and tourism industry including: an introduction to business operations in leisure and tourism, factors influencing customer choice and an introduction to destinations, impacts and sustainability. This unit is externally assessed. This unit is about understanding different parts of the leisure and tourism industry including: sales, promotion and promotional techniques and materials in the leisure and tourism industry and operations used in the leisure and tourism industries. This unit is internally assessed.